Developments in the Basel global bank capital and regulatory framework are significant and ongoing, and are focusing on the overhaul of the standardized approaches for a multitude of risk exposure capital requirements. Other initiatives include the ongoing evolution of the Basel III framework, with specific focus on the Basel Committee on Banking Supervision’s restructuring of the standardized approaches for calculation of regulatory capital requirements. The 2016 finalization of the Basel Fundamental Review of the Trading Book change processes has culminated in a new market risk capital framework (effective 2019) with the issuance of the new Basel Revised Market Capital requirements. These and other developments are covered in detail in this timely, one day seminar delivered by leading risk management experts. 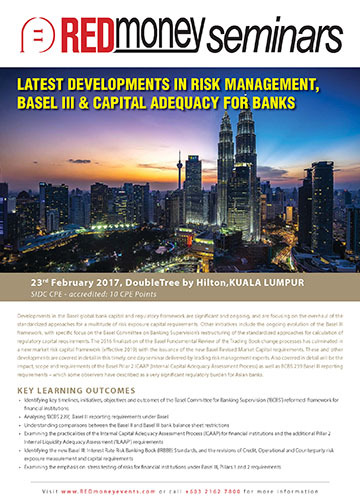 Also covered in detail will be the impact, scope and requirements of the Basel Pillar 2 ICAAP (Internal Capital Adequacy Assessment Process) as well as BCBS 239 Basel lll reporting requirements – which some observers have described as a very significant regulatory burden for Asian banks.